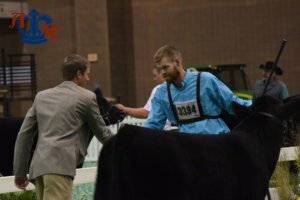 On the afternoon of the first Saturday of the 2016 American Royal, Salers enthusiast occupied the east side of the Hale Arena. Curtis Doubet of Parker, Colorado, sorted through the impressive line-up of heifers and bulls. 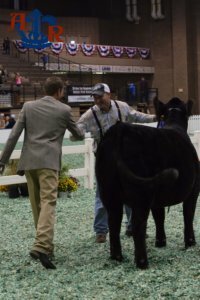 The Champion Senior Heifer was awarded to GG&T Cattle Company of Quinter, Kansas, and the Reserve Champion Senior Heifer title went to Taylor Goering of McPherson, Kansas. GG&T Cattle Company claimed the Grand Champion Salers Female and Audrey Bracken of Basehor, Kansas, grabbed the Reserve Champion Salers Female banner.